Welcome to JAPANESE WAGYU BEEF OF THE MONTH CLUB. AKA KOBE BEEF. GRADE A 5. 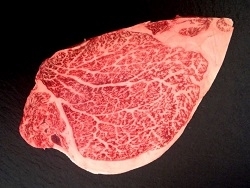 Our Japanese Wagyu Beef comes from Miyazaki Prefecture. Steak of the Month Club is the oldest and most trusted online mail order Steak Club in North America since 1989. Welcome to JAPANESE WAGYU BEEF OF THE MONTH CLUB. AKA KOBE BEEF. GRADE A 5. Our Japanese Wagyu Beef comes from Miyazaki Prefecture. Steak of the Month Club is the oldest and most trusted online mail order Steak of the Month Club in North America since 1989. Each month our subscriber will receive TWO (2) JAPANESE WAGYU STEAKS. 1 INCH THICK. Product of JAPAN. Aged to Perfection. TWO(2) 1 INCH THICK JAPANESE WAGYU STEAKS – GRADE A 5 - AVERAGE WEIGHT PER STEAK - 8 TO 16 OZS.